At one time, the Fianna were called to defend Ireland’s shores from the invading King of Lochlann. They won the battle when their leader, Finn Mac Cumhaill killed the King of Lochlann and his sons, breaking the will of the invading army. Finn spared the youngest son, Miadach, who was just a boy, and brought him back to his home as a hostage and fosterling. Finn treated all his fosterlings well, and held no grudge against Miadach for his father’s enmity. The same could not be said for Miadach. He took all Finn’s generosity with a smile, but he nursed a secret hatred all through the years. When he came of age, Finn gave Miadach lands on the coast, and Miadach left without a backward glance. Some time later, the Fianna were hunting. Finn and a few of his companions followed the tracks of a giant boar, and were separated from the main part of the Fianna, and there on the road, who did they meet but Miadach! Finn greeted him warmly, and Miadach seemed delighted to see them. He invited Finn and his friends to come with him to the Hostel of the Quicken Trees for a drink. Conan Maol Mac Morna, who was known for his blunt speech as much as his bald head, protested that Miadach had never been so friendly to Finn Mac Cumhaill before, so perhaps they shouldn’t trust him! But Finn reprimanded him for his bad manners. All the same, just to be on the safe side, Finn split up his company. Taking Conan Maol and his brother Goll with him to the Hostel, he told his own son Oisín to wait for the rest of the hunt, along with Diarmuid O’Duibhne, Caoilte Mac Ronán, and three young warriors; Fodla, Caoilte’s son Fiachna, and Fiachna’s foster-brother Innsa, to wait on the hunt, while he went with Goll Mac Morna and his brother Conan Maol to share this drink with Miadach. Miadach led them to a lovely hostel, with Quicken-Trees all around. They could see the walls of every colour, the coverings on the floor, and the fires giving off sweet smoke through the many windows and doors. Miadach ushered them in ahead of him, and the warriors were so busy admiring their surroundings and settling in that it took them a moment to realize that he hadn’t followed them at all. He was nowhere to be seen. Finn agreed that there was. In fact, all the loveliness on the hostel had vanished, and now it was a mean, bare hut, with no windows and only one door, and a dirt floor under them. At this the warriors realized that something uncanny was afoot. They tried, each one, to leap to their feet, but found that they were stuck fast to the cold earth floor! The more that they struggled, the faster they were stuck, till soon only Finn had so much as a hand free. Conan Maol started to curse Miadach, and curse Finn for accepting his invitation to this treacherous place! “And get themselves just as stuck as we are!” snarled Conan Maol. That was a fair point, so Finn put his thumb between his teeth, that he had burnt long ago on the Salmon of Knowledge, and he could straightaway see the treacherous plans of Miadach. “It’s worse than we thought,” said Finn. The three men then sounded the Dord Fiann, the great battle cry of the Fianna, but only Fiachna and Innsa heard, and they came running. “Don’t come in, you eejits!” Conan Maol cried, and Finn and Goll told them all that had happened. The two young warriors took it upon themselves to find the armies of the King of Torrents. At the bottom of the hill, they found a ford that anyone coming to the Hostel of the Quicken Trees would have to cross, and they decided to make their stand there. 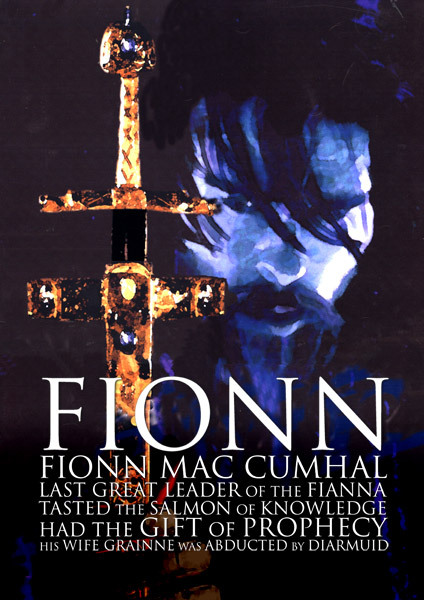 That night, one chieftain under the command of the King of Torrents decided that he would take his part of the army on ahead, and kill the famous Finn Mac Cumhaill himself, and win all of the glory, but when he got to the ford, Fiachna and Innsa were waiting for him. They fought long and hard, and when dawn broke, the ford was choked with the bodies of the dead, but Innsa too had died of his terrible wounds. Fiachna had to tell Finn, and Finn wept, for Innsa had been another of his foster-sons. The brother of the chieftain who had hoped to steal all that glory came next to the ford, and found Fiachna waiting, desperately tired, but grim with purpose. They were too frightened to attack the young man who had clearly laid waste to all the chieftain’s followers, but Miadach came then, and challenged Fiachna to combat. Now Oisin and the others had heard nothing of all of this, so when they came to find Fiacha and Innsa, they had a terrible shock. Oisin and Caoilte, being the fastest runners, went straight away to find the rest of the Fianna, leaving Diarmuid and Folda to follow the sounds of battle till they came upon Fiachna, fighting with Miadach. Diarmuid waded in and killed Miadach, but Fiachna did not long survive his wounds. Fodla held the ford while Dirmuid brought Miadach’s head back to the Hostel, to show Finn that the two young warriors had been avenged, and promised to hold the ford till the rest of the Fianna could come. As soon as Diarmuid came back to the ford, Fodla fell into an exhausted sleep, even that brief amount of time was too much for any ordinary warrior of the Fianna. Bur Diarmuid was no ordinary hero. He held the ford against all the armies of the King of Torrent’s sons, and as soon as Fodla woke up, the two of them were able to work together to drive the armies back! They hunted down the three sons of the King of Torrent and cut off their heads. Leaving Fodla to hold the line at the ford once more, Diarmuid rushed to the Hostel of the Quicken Trees, with the blood running out of the heads all the while. He went first to Finn, and had to bathe him in blood before he was able to pull himself up off the floor. Then he wen to Goll Mac Morna, and poured blood all over him, and at last to Conan Maol. But by that time, almost all the blood had run out. He was able to get Conan’s arms and legs unstuck, but his back stayed firmly tethered. They grabbed hold of his arms and legs and pulled. Finn and Goll had been struck by the same enchantment, so they knew how fast it held. Conan should have been in agony, but he only roared at them to pull harder, and braced with his legs against the floor of the hostel. At last, with a terrible tearing sound, Conan Maol was pulled to his feet, but he had left all the skin of his back behind him! Bleeding terribly, they realized they would have to do something to help him. Finn sent Diarmiud back to the ford, as there was still an army on the other side, and he could see that the King of the World had arrived with his armies to help the King of Torrents! They were still in terrible danger. Finn and Goll were too weak from the enchantment to fight, and Conan would bleed to death if they didn’t find a way to help him. Then, Finn saw a black sheep grazing nearby. He felt about a match for a sheep at that moment, so he killed the sheep and took the skin off its back and put it over the wounded Conan Maol. There must have been some magic of adhesion still left on Conan’s back, because the skin of the sheep stuck fast to him, and before long it grew in place of his old skin, as good as new, and warmer in the winter! By this time, Oisin had found the rest of the Fianna, and as dawn broke, Finn, Goll and Conan felt their strength coming back to them. They raced down the hill to the ford, and the whole of the Fianna together made such a slaughter of the armies of the King of the World that there were few survivors left to tell the tale. But every year after that, in the springtime, someone in the Fianna had to sheer the wool off Conan Maol’s back.